BBC Radio Manchester’s Breakfast Show, featured PossAbilities today (16th January 2017), in a live outside broadcast from the Cherwell Wellbeing Garden & Farm. Reporter Richard Stead interviewed Chief Executive Rachel Law about the remarkable growth of PossAbilities since it’s ‘spin-out’ from Rochdale Council. As you might expect, a number of our animals got in on the act too, with listeners having their cornflakes to the sounds of grunting pigs and twittering birdlife. Mark Broadbent (aka Spud) told listeners about the things he loves about coming to The Social Lounge and working on the farm. Without this place “I would just be bored at home” he said. 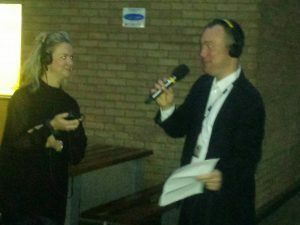 You can listen again on www.bbc.co.uk/radiomanchester …. fast forward to approximately 7.40 and 9.55.